Hi forum, I'm G0LD Z! an this my first hack!!! 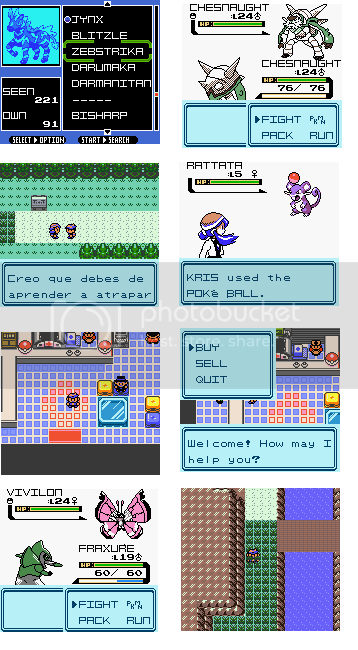 After that the girl who first helped risk scolds coaches fight , but then thanks them which have saved , and I will say it is the teacher's assistant elm , and that the bag she carried was an important research that the famous Professor Oak will request , and then tell them your name is KRIS . Then tell them to go to the lab in spring town , where I told him what happened to Prof. Elm, which after reaching the value is amazed at enfrentase had two thugs, why is when they give you a pokemon to be coaches to return , saying they have to be big wooden coaches, and that 's not a mistake, since for years discovered the talent of a guy who started from scratch and made ​​it big. According to a legend existed a powerful alien dragon that formerly was called " the legendary original" , but his body was divided into three , resulting in another 2 dragons, gamma team now wants to take that legendary , using energy of mysterious orbs, but need 2 people that their ideology is based on truth and justice , to attract the two legendary dragons and so to see the third legendary , the dragon power balance and unite the three to revive the legendary original, which will return to the top of Mt silver to be under the orders of whom met all three. i want support to my hack, you can bring me support!!! Cool, i'll support your hack is amazing. Support my too (link in my signature). No problem mate, and i'll try to help you in what i can. Looking great mate, the story looks pretty interesting. And the new upper case font looks really nice! Are you going to edit the lower case font too? To me, it doesn't seem to fit your new upper case font, but it's your take. Looks cool, especially the Title Screen! If you also want your game sound cool, you should put Custom Music in it. It seems cool after all. I'm curious if you'll implement also some features from HG\SS since 4 years have passed. I like the art of Munna used in this hack. THe HUD being light blue is also a nice touch. Cool, I totally support Ice Silver, keep it up! So good luck with completing it. Gym leaders are lookin' nice! This looks really cool. I hope you don't give up! My only comment, as Crystal_ said, you should update the lowercase font also. It would make it feel that much more fresh. I like tht text box G0ld Z!. 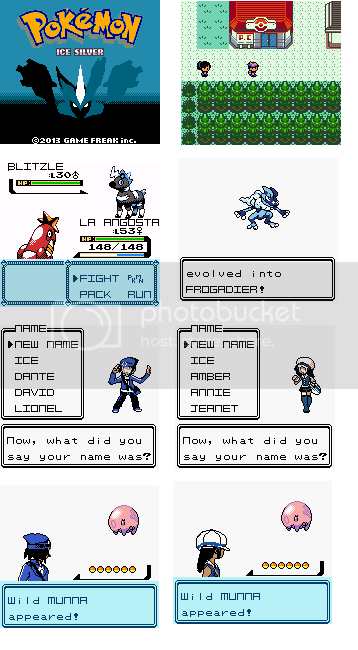 And sprites lookin' cool. Very good, the tiles are impressive, for me. It seems that I have seen you on wahackforo. It's undoubtedly a great hack. It looks like in the second image the horizontal path connects with the edge of the platform hiro is currently on. I'd move the path one block above, or, if the tileset makes it possible, only half a block above so that it connects with the middle of the platform. My poor thread, looks veeeeery death and empty :c, this thread Needs to be updated.